We were deeply moved by the memorable Washington Post Super Bowl LIII ad; it was impressive – the message is strong and important. The placement of the ad, during the most exciting moments of the game, was providential. We are grateful to The Washington Post for their decision to include our son Austin Tice. It was an honor to be part of the hectic process of creating such a powerful message in less than one week. We hope the vast audience will amplify the call for Austin’s safe release. We faithfully pray we will soon see Austin walking free again. We want to thank the Press Club for hosting us. Also, we sincerely appreciate everything Ayman Mhanna has done to pull this event together. Thank you all for being here, thank you for continuing to cover the news of our son’s captivity. Austin is the eldest of our seven children. He is a big guy with a big personality and a big heart. He loves being the big brother to all of his siblings – they miss him in so many ways. Austin is an avid reader and always had a keen interest in World History. When he was still quite young, his desire to know about the world grew into a passion for news of current events. He grew up listening to world news on the radio and reading global news publications. He always dreamed of being an international correspondent. As his curiosity and knowledge of the world expanded, his desire to better understand global issues grew into a sense of duty wrapped in a heart of compassion. He first learned to lead through service to others as he became an Eagle Scout. Later, he gained a deeper understanding of international politics as he graduated through Georgetown University’s School of Foreign Service. His sense of duty compelled him to enlist with the United States Marine Corps, where he became an esteemed Captain. Most recently, in the summer before his final year of law school, all of his interests, and his passion, and his experience coalesced into a call to bear witness in Syria. Austin began reporting from Syria in May 2012. On the 14th of August in 2012, on a Tuesday, 329 weeks ago, Austin was detained at a checkpoint near Damascus. He remains captive in Syria, now six years, three months and three weeks. This is our eighth trip to Beirut, our first press conference was here, in this room, 6 years ago. We are here again to continue to raise awareness of Austin’s detention and to advocate for his safe release. Freedom of expression and access to accurate information are fundamental human rights, regardless of frontiers. Even so, today we find that journalists worldwide are in greater danger than ever before. Austin went to Syria as a photojournalist. It is said that one picture is worth a thousand words. Austin wanted people to see how armed conflict, particularly in an urban environment, affects the innocent, especially children. Soon after his first photos were published, he was writing articles to explain his pictures and describe what he was seeing. 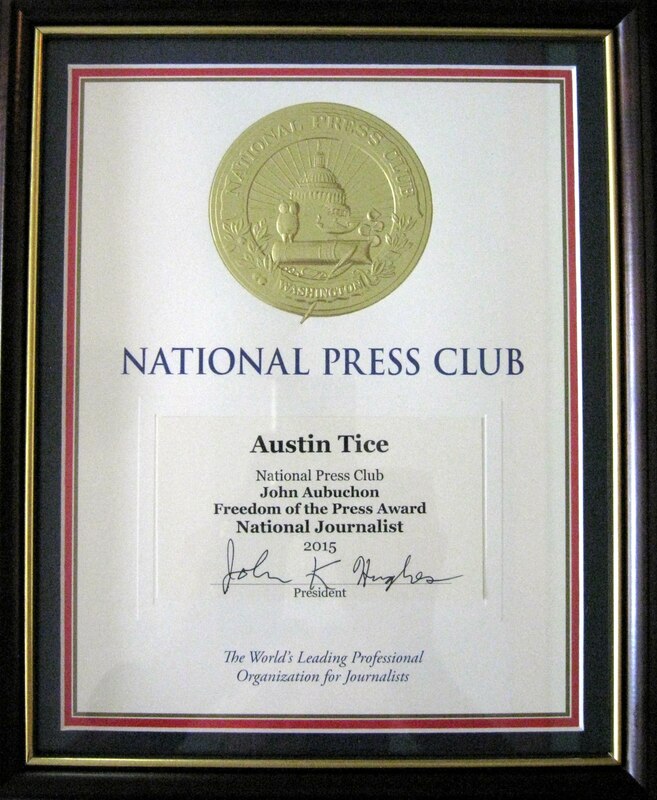 Austin was honoured for his journalistic skills with the McClatchy President’s Award, a George Polk Award, and other significant recognitions. We believe Austin is detained because of his work as a journalist. Austin did not disappear into thin air. He was detained at a checkpoint – there are witnesses. Through these long years, we have periodically been told by reliable sources that Austin is alive and is being properly cared for. On November 13, Special Presidential Envoy Robert O’Brien emphatically stated that the United States government believes Austin Tice is alive and is being held in Syria. Additionally, we have recently been contacted directly by a number of credible individuals, who have shared information about Austin. Earlier this year the FBI offered a reward of up to one million dollars for information that leads to Austin’s safe return. Recently, a coalition of media and other organizations in the United States announced plans to match the FBI offer. We are appealing to anyone with information about our son to share it NOW – 6 years is much too long to keep this secret. We are asking you, all of you, as Austin’s colleagues, to join us in continuing to raise awareness of Austin’s detention as we continue to work for his safe release. We implore you, in the course of your work – ask about Austin and create opportunities to draw attention to the urgency of securing Austin’s safe return. As you all know, there is no way to prepare for being the parents of a captive – there is no instruction manual. From the very first day, we have been doing everything we can think of to bring our son home. We have learned more than we ever wanted to know about how governments work – and how they do not work. We have made mistakes and missed opportunities, which we deeply regret. Nevertheless, we continue with faith and determination to see our son walk free – to hold him joyfully in our arms again. We have met with two United States Presidents, 3 Secretaries of State and a parade of other officials. In 2014, Debra lived in Damascus for over 3 months. She returned in 2015 for two weeks; she was asking for help to find and free our son, willing to meet with anyone who was willing to listen. This year, we have spent more time in Washington, DC than ever before – pushing our government, meeting with advisors, seeking help from non-governmental organizations and individuals. We were in New York City at the opening of the General Assembly. Now, we are here again in Beirut, hoping to go to Damascus, asking you to amplify our call for help, and meeting with officials and other contacts. We have applied for visas to Syria, so we can continue to appeal to Damascus as we have to Washington, DC that every effort be made to locate Austin and secure his safe release. Because Austin is an American and because he is detained in Syria, we urge both the United States government and the Syrian government to work together to resolve this humanitarian issue. No one is benefitting from Austin’s continued detention. Austin’s release will satisfy not only the longing of our family, but will also create international goodwill. Both governments have assured us they will do all they can to secure Austin’s safe release. We call on them – now more than ever – to honor that commitment. Bring our son home. This is the seventh holiday season of Austin’s detention. We miss him MORE, never less, with each passing day. Our family has changed and grown. We are intensely aware there is suffering all across the Levant. We still feel the pain of the empty chair at every family gathering – every event Austin has missed. We pray and hope there will soon be an end to violence, restoration of families, and the beginning of healing. We will continue to faithfully pray and relentlessly work for Austin’s safe return. May we soon see Austin walk free. We are heartened by the recent United States Government posting of a reward for information leading directly to the safe return of our son, Austin. As far as we know, the timing of this reward is unrelated to any specific event; rather, it is prompted by the length of Austin’s detention and the Syrian government’s lack of information concerning Austin’s disappearance. We deeply appreciate every increased effort to hasten the day that we see our son safely home. Austin has been living in captivity for more than five years and eight months. If anyone has information which might restore Austin’s freedom and reunite our family, we urge them to share it. Austin was kidnapped in Damascus, Syria on August 14, 2012 while working as a freelance journalist and photographer for a variety of news organizations including CBS, The Washington Post, and The McClatchy Company. Austin was kidnapped while reporting in Daraya, a Damascus suburb. The United States Government is offering a reward of up to $1 million for information leading directly to the safe location, recovery, and return of Austin. If you have any information concerning Austin Tice, please contact the FBI Tip Line at tips.fbi.gov or findaustintice@fbi.gov. You can also contact your local FBI office, or the nearest American Embassy or Consulate. Our beloved eldest son, Austin Tice, an award-winning freelance journalist, has been held captive in Syria since 14 August 2012. Austin was taken captive three days after his 31st birthday. We can only imagine the things he was dreaming of doing – what he might have accomplished, enjoyed, and experienced during these five important years of his early thirties, including his graduation from law school. During these nearly five years his family has been keenly aware of his empty chair, sorely missing his big hugs and wonderful laugh. In addition to so many birthdays and holidays, he was absent from the weddings of two of his sisters, and as a doting uncle he has yet to meet their two beautiful new babies. We continue to do everything we can think of to find information about where our son is and what is required to bring him safely home. We are willing to engage with any government, group, or individual who can help us in our efforts to secure Austin’s safe release. Because Austin is an American being held captive in Syria, we especially call on the United States and the Syrian governments to locate Austin, protect him, and secure his safe return. In this effort, we have made numerous trips to Washington DC and Debra has spent extended time in Damascus. A proof of life video was posted on YouTube just six weeks after Austin went missing. We now realize the response to that video was not appropriate. We plead with those holding Austin to reach out again and give us the opportunity to meaningfully engage with them toward Austin’s safe return. We are often asked what people can do to help. Above all, we appreciate continued prayers for Austin and for our family. We encourage everyone to help raise our voice in asking for Austin’s freedom. We ask to be given any information about Austin which may help secure his safe return. In anticipation of Austin’s 36th birthday on 11 August, and with fervent hope that he will be home soon, we invite you to send Austin a birthday greeting by email or by post. Marc >> First of all, we would like to thank Youssef Howayek for hosting us here at the Beirut Press Club. Debra >> We also thank Ayman Mhanna for being here on behalf of the SKeyes Center and Alexandra El Khazen for coming here from Paris on behalf of Reporters Without Borders. We sincerely appreciate their steadfast support over the past almost five years of working to locate and secure the safe release of our cherished son, freelance journalist Austin Tice. Marc >> We thank you all for being here today and continuing to seek information about our son Austin Tice. Your work and your support are vital to our efforts. Debra >> This is our third press conference in Beirut. The reason we are here again today is because almost five years ago, 3 days after his 31st birthday, on August 14, 2012, our beloved Austin was taken captive in Syria. We have had no contact at all with him. Five years is a very long time for any parent to be missing their child. We are profoundly aware that many other families in this region are enduring this same agony of missing a loved one. We have counted every moment of every one of these 1802 days since we last heard from Austin. We are always saddened by his absence from family gatherings, especially birthdays and holidays. We desperately want him to come home. Marc >> When he was taken, Austin was working as a freelance journalist. When any journalist is silenced, we are all blindfolded. Freedom of information is a basic human right. We have every reason to believe Austin is alive and is being held captive in Syria. We continue to do everything we can think of to find information about where our son is and what must be done to bring him safely home. We are willing to engage with any government, any group, or any person who can help us in our effort to secure his safe release. Debra >> In addition to several trips to Beirut, over these past almost five years, we have made numerous trips to Washington, DC and I have spent extended time in Damascus as part of our effort to make contact with people who can help us and with anyone who might have information about Austin. Marc >> Because Austin is an American being held captive in Syria we continue to ask that the United States government and the Syrian government make every reasonable effort to locate Austin and secure his safe release. Both of these governments have assured us that they are doing this, but the only proof of that commitment will be Austin’s safe return. Even so, we do not dare rely solely on government efforts. We are open to pursuing any channel, any opportunity which will bring our cherished son safely home. And so, we continue to seek the help of any group or any person who has the ability to help Austin. Debra >> Six weeks after Austin went missing in 2012, a proof of life video was posted on YouTube. The title of that video was “Austin Tice is Alive”. We now realize that the response to that video was not appropriate. No one, including us, asked about a next step to engage toward Austin’s release. Realizing this horrible mistake, we now plead with those holding Austin to reach out to us again and give us another chance to communicate. Our website, austinticefamily.com has our contact information. We want our son safely home. Marc >> Every single day we hope to get that call from Austin telling us he is on his way home. August 11 is Austin’s 36th birthday. We invite everyone to send Austin a birthday greeting, via email or post. We can hardly wait to give them to Austin when he returns. Debra >> Thank you again for being here today. Thank you for sharing this message. Stay well. Stay safe. Do good work. We wish you all the best. We are very happy for the Dawes family with the news of Kevin’s safe release and we can only imagine the relief he and his loved ones must be experiencing. We sincerely hope Kevin’s release is a precursor of Austin’s imminent freedom. The collaboration of Syria, Russia and the United States in Kevin’s return is quite heartening to us. We pray this is a sign that the release of detainees sought by UN Envoy Staffan de Mistura will become a reality, and that many, many more families will soon rejoice in the safe return of their loved ones. Your tweets, emails, messages, posts, pictures, comments, articles, cards, letters, petition signatures and calls touch our hearts profoundly. They lift us up, especially at this difficult moment. And surely, their resonating message must also reach and lift Austin’s heart, as he endures another terrible anniversary without freedom. We humbly ask you continue to think of, pray for and ask others to add their voices to bring Austin safely home. After six months of what we believe to be a sincere and dedicated effort to update and clearly define US hostage policy, we are cautiously optimistic that the Executive Order signed by the President is a significant beginning towards effectively bringing our son Austin and other American hostages safely home. We hope this policy will instill in our government a clear focus on the soonest, safe return of all current and future hostages. We continue to have concerns about several issues, including the leadership structure described in the policy, and the lack of specific mention of the protection of the identity and assets of hostages. Nevertheless, we think this is a strong start, and we appreciate the President’s commitment to periodically reviewing and improving this policy. Our family will be delighted when we hold Austin in our arms as proof of the effectiveness of this new policy. Thank you all very much for coming here today. Special thanks to SKeyes and Reporters without Borders for coordinating this event. Austin was in Syria because he believes freedom of information and freedom of expression are fundamental human rights. At a time when few western journalists were reporting from the region, it was important to him that the world hear both sides of the story and know as much as possible about the effect of the conflict on civilians – especially children and families. We realize there is unbelievable misery all across the Levant and that my family’s anguish is only a drop in that horrific sea of human suffering. Our hearts are joined with those who are experiencing this terrible pain and loss. So, only as a mother, I am here asking for information and for help to find my son and bring him safely home. We know Austin is not being held by any part of the opposition. Still, after all these 1009 days, we do not know where he is nor who IS holding him. Someone, someone possibly near this place, knows something about my son and his whereabouts. I plead with anyone who knows anything at all about Austin to find a way to contact us with that information: we have a website and facebook page, or through SKeyes or Reporters without Borders. We have every reason to believe Austin is alive. As recently as a few weeks ago, and a number of times over the past 33 months credible sources have told us Austin is alive. We are grateful to his captors for keeping him well and safe. Can my son be allowed these days to communicate with me – by phone while I am in Beirut? Are the holders of my son ready to meet face to face – with “One” individual (alone) and let him meet with my son, a friend of the family, and known by some Shiite leaders in Lebanon and beyond over years? Finally, an update on what our government is doing for Austin. For more than two and a half years, we have been urging our government to directly engage with the Syrian government to find our son and secure his safe release. We base this request on the fact that Austin went missing in Syria and the sovereign government should have the resources to search for him and to persuade his captors to release him. Recently, the U.S. State Department issued a statement saying they are in “periodic direct contact” with the Syrian government regarding consular affairs, including Austin’s situation. We think this is a good start. We are glad that the two governments are communicating directly, but more is needed! – communication must be regular and consistent. We ask for a collaborative effort. Both the United States and the Syrian governments have told us they will do all they can to locate and safely return Austin to us. Because Austin is an American and because he is alive in Syria, we implore both governments to act on this commitment until we have the ONLY measure of success – Austin’s safe release. I long to hold my son in my arms. I want my family to be whole again. Our son, Austin Tice, was working as a journalist near Damascus, in Syria, when he was taken captive on Tuesday, 14 August, 2012. We can hardly bear to realize Austin has now been disconnected from us for more than ONE THOUSAND DAYS. Each of those days has a story: of family and friends, of politics and pop culture and world events, joys and griefs which should have been shared with Austin. Instead, every day has been another day of searching and longing for his return so we can make our family whole again. We have desperately missed Austin for over 1,440,000 minutes – each new minute fuels our resolve to find him and bring him safely home. We are so grateful for the generous and selfless support of many organizations and individuals. Thanks to the #FreeAustinTice campaign, more people learn about and express support for Austin every day. We are thankful to everyone who is participating in the campaign, and to all those who have supported us and Austin with your thoughts and prayers. Please, please continue to share Austin’s story and ask others to add their voices to our plea for Austin’s safe return. We continue to urge President Obama to do all he can to bring Austin home safely and soon. We remind the Syrian government they have assured us they will work to locate Austin and secure his safe release. And we ask anyone with information about Austin’s whereabouts, or who can help with the safe return of our son to please contact us at austinticefamily.com. From the beginning of this ordeal we have asked that the United States and Syrian governments do all they can to locate and safely return Austin to our family. While we are disappointed that Austin has not been seen, we are encouraged by the ongoing discussions between the US and Syria. We hope and pray that their efforts will soon be successful in locating and safely returning Austin. The release of any hostage is a blessing, and a great joy to their family and friends. We sincerely hope everything possible is being done for the safe return of our son, and, as ever, we hope to see Austin safely home as soon as possible. Any questions about the US State Department’s work in the region should be directed to them. Debra and Marc Tice live in Houston. As the parents of an international hostage, our hearts are broken again by the tragic news of the death of Luke Somers in Yemen. This month’s failed rescue attempt once more brought into intense focus the need for the U.S. government to involve families in its policies and procedures for responding when Americans are taken hostage . On Aug. 14, 2012, when our son Austin Tice was taken captive in Syria while reporting on the conflict there, our lives were turned inside out. The oft-repeated cliche is “there is no handbook” for what we are going through. That hardly begins to express the challenges we face. In reality, no government policy and no established support network exist to help families navigate the many questions suddenly requiring an answer: questions regarding interaction with the government; questions about protecting Austin’s identity and assets; questions of managing a relationship with the media; questions about preserving some semblance of normal life for our family. All of these pale in significance to the biggest question of all: What can and should we do to get Austin safely home as soon as possible? Last month, the White House ordered a review of the U.S. government’s hostage policy. Many issues need to be addressed as part of this review. Former captives and families of hostages, along with the government entities responsible for bringing captive Americans safely home, must be involved in this discussion. As part of this process, the Office of the Director of National Intelligence should be ordered to coordinate efforts among all the agencies involved — both to improve inter-agency information-sharing and to avoid ­redundancy. Currently, according to the Web site Intelligence.gov, “Seventeen separate organizations unite to form the Intelligence Community. Each member agency operates under its own directive.” Each agency has a defined mission that prioritizes its objective. As it relates to hostages, the work of these agencies must be aligned with a single primary objective: the safe return of American citizens held overseas. Before leaving for Syria, Austin was living as an independent adult, with all the usual responsibilities and obligations. Over the more than 850 days that he has been held captive, we have learned that no policy safeguards the identity, assets and obligations of our missing son. We face often insurmountable obstacles as we struggle to protect his online identity, secure his bank accounts, freeze his debts and in other ways try to ensure that he has a life to come home to. A comprehensive hostage policy should include a method for suspending a hostage’s obligations, such as rent, loans and insurance, as well as for preserving a phone number. In this digital age, it should also be possible for elements of a hostage’s online identity, including social media and e-mail, to be appropriately accessed and managed. There should be an immediate, comprehensive evaluation of any vulnerable assets, such as bank and credit card accounts. If these assets are not frozen, they must be appropriately monitored for any malicious activity. A clear and efficient mechanism needs to be in place to ensure that any stolen assets are returned or reimbursed to the hostage. Austin did not provide us with access to his online accounts. However, government agencies using subpoenas have been able to mine them for clues. Officials often refuse to share what they find with us; moreover, we cannot even be certain it is shared among relevant agencies. The information may just be stored away in a file somewhere. When the family of a U.S. citizen becomes involved in an international hostage crisis, the many necessary decisions can be overwhelming. Some are immediate, while others unfold as the days become weeks, then months and sometimes years. Because each case is unique, truly there can be no “handbook.” However, there can and should be frequently updated guidelines covering things to consider, as well as an informed government liaison to provide support and advice. If ransom becomes an issue, families should be included in an honest discussion of the options. There is no simple answer that can be applied to every hostage scenario. Each family should be free to choose the level of involvement with which it is comfortable. When security clearances are required to be able to clearly communicate timely and accurate information with the family, our government should stand ready to facilitate the necessary vetting. Appropriately vetted family members can be an essential and critical part of the team, especially since they are likely to be the ones contacted by those with information about the captive. Additionally, they may be the only team members whose clear and singular objective is the safe return of their loved one. These issues are likely to affect every international captive and need to be discussed and addressed in any serious policy review. To be fully credible and complete, the current policy review must include former captives and families of hostages together with the government entities charged with bringing hostages safely home. It has been two years since our son, freelance journalist Austin Tice, was taken captive near Damascus, Syria where he was reporting for McClatchy News, the Washington Post, CBS and others. We have had no contact from Austin or his captors; we still do not know where he is or who is holding him. Austin put his education at Georgetown Law School on hold, first to fulfill his sense of duty to serve his country, and again to pursue his calling as a journalist. Austin is proud to be the eldest brother, an uncle, an Eagle Scout, a Georgetown University graduate, a Marine Corps veteran, and a widely published freelancer. He respects loyalty, discipline, ambition, courage, and commitment. With his absence, a huge chunk of our life is missing. As his parents, we cannot give ourselves fully to the present because we remain suspended in the day Austin went missing, a day which is now 17,520 hours long. As we relentlessly pray and work for Austin, we are continually unsettled by disturbing questions about his welfare. What does he eat? Does he see the sky? Is he alone? What challenges is he facing day-to-day? Does he know we are looking for him? How does he mark the time; does he know two years have passed? In those two years, along with the significant dates on the calendar and the once-in-a-lifetime events dampened by Austin’s absence, there are also the small daily moments – joys, challenges, blunders and blessings – which have not been shared and cannot be relived. We do not want Austin to be forgotten. We fervently pray for him. We continue to do everything we think of to bring our son safely home. We sincerely appreciate each person who has helped and supported us. Words cannot fully express the depth of our gratitude for every bit of every kind of help we have received. Please keep thinking of Austin, please keep searching, and please keep praying for his well-being and safe return. To those holding Austin, we ask you to treat our son well and return him to us safely and soon. Austin is a man of good character, and his effort to tell the world about what is happening in Syria – from all perspectives – is honorable. We will not give up; we want to see our son safely home. May it be soon, according to God’s will. We hope the amnesty President al-Assad announced today will lead to the reunion of many families with their loved ones, and we pray it will encourage Austin’s captor’s to quickly and safely release Austin so our family, too, may be reunited. Damascus, (SANA) President Bashar al-Assad issued Monday Legislative Decree no. 22 for 2014 granting a general amnesty for crimes committed before June 9, 2014. The amnesty does not affect convictions from personal lawsuits which remain under the jurisdiction of courts and the individuals or sides who files the lawsuits. It has been more than one year and a half since we last had contact with Austin. The passage of time sharpens our pain and strengthens our resolve. We continue to seek support to find and bring Austin safely home, and we continuously give thanks for everyone who has and is helping us make his return a reality. Our prayers go out to everyone whose lives have been impacted by events in Syria and the region, we know there is pain far beyond our own. Still we hold out hope – not only for Austin, but for all. May peace prevail. سنةٌ ونصف السنة مضت حتى الآن على آخر اتصال لنا مع أوستن. مرور الزمن يزيد من آلامنا ويقوّي عزيمتنا. سنبقى نناشد العالم لمساعدتنا في البحث عنه وتأمين عودته. نحن نصلي دائماً من أجل كل الناس الذين تأثروا بشكل أو بآخر بالأحداث التي تجري في سورية وفي المنطقة، ونعلم تماماً أن هناك أناساً تزيد آلامهم عن آلامنا. مع كل ذلك، فنحن لن نفقد الأمل، ليس فقط بعودة أوستن، إنما بأن يعمّ السلام جميع الناس. It has been 365 days since we last heard from our precious son, beloved brother, adored uncle, and faithful friend, Austin. None of us want to place special significance on this date because we know that every one of those days has been unimaginably challenging for Austin. The most tolerable aspect of this day is that it means we are one day closer to the return of Austin, of all other captives, and relief of the suffering of the Syrian people. It also presents another opportunity to express our heartfelt appreciation to the many people and organizations who steadfastly work and pray for Austin’s safe return. We can never repay our deep debt of gratitude to every one of you. We thank our Texas Senator John Cornyn and his office for initiating, drafting, and managing the signing and delivery of the letter to Secretary of State Kerry, imploring him to continue to use all efforts to secure Austin’s release and safe return. We also deeply thank Texas Senator Ted Cruz, New Hampshire Senators Jeanne Shaheen and Kelly Ayote, and Vermont Senator Patrick Leahy for contributing both their signatures and their support to Austin and our family. This is a season of family togetherness, of hope and joy. We wish everyone who sees this all those things. We ask you to light a candle, say a prayer, spare a thought for all those missing and suffering; that the missing would be found, the suffering alleviated, and joy return. Six months ago, on August 14, we unknowingly began marking time with silence: 185 silent days, 27 silent Tuesdays, 6 silent months. On that day, our cherished son and beloved brother, journalist Austin Tice, was taken captive in Syria. Despite our best efforts, and the efforts of our government, many friends and journalists, as well as kind strangers, we still do not know with certainty who is holding Austin or how to secure his release. We appeal to whoever is holding Austin to treat our son well, keep him safe, and return him to us. We urge anyone with information to contact us through our website: www.austinticefamily.com. Many things have happened in our big family while Austin has been confined. We miss him terribly during all the celebrations and feasts of the holidays; our hearts are heavy with longing for his great storytelling and contagious laugh. Even so, our family is ever mindful of and sincerely thankful for the many people who sustain us with kind thoughts and steadfast prayer. This was to be Austin’s last semester at Georgetown Law School. Rather than pursue the traditional summer internship, Austin felt compelled to travel to Syria as a journalist. Equipped with cameras, an exquisite writing talent, and an instinct for finding his way to the center of things, in May our son crossed over the Turkish border into Syria. He courageously embraced the risks of freelancing in the pursuit of truth. He wanted to both experience and understand the fundamental motivations of the Syrian people. He was committed to preserving an accurate history for the children of Syria, whose future continues to be altered day by day. His work, published by McClatchy News, The Washington Post, CBS, CNN, the BBC and others, fulfills that commitment. His work demonstrated keen insight and provided thoughtful analysis as he worked to objectively give an account of all sides of this most complicated story. We continue to pray and work for Austin’s safe return. Though we are dismayed by the passage of time, we are not deterred. We are amazed, humbled and deeply grateful for the support of many, many individuals and organizations, especially the global family of journalists. We trust that all of these efforts, by the will of God, will end the silence and bring our son safely home. Today, our family joins people around the world in reaffirming the principles of press freedom. Our thoughts and prayers are united with all the families of journalists now missing or silenced. We continue to ask everyone who can, including the government of Syria, to assist us in locating Austin and securing his safe and prompt release. We urge whomever is holding Austin to show compassion by allowing us to have contact with our son and returning him safely to our family. It has been more than 9 months since our son, freelance journalist Austin Tice, was taken captive by unknown persons near Damascus, Syria, where he was reporting on the Syrian conflict for McClatchy News, the Washington Post, CBS and others. With the exception of a distressing 47 second video released in September, we have had no contact from Austin or his captors. We do not know with certainty who is holding him captive. While we have been desperately missing Austin, Austin has also missed many important personal and family events. Most notably, he missed the announcement of his receipt of the prestigious George Polk Award for War Reporting as well as the McClatchy President’s Award for Journalism Excellence. Just last weekend, he missed his own long-anticipated graduation from Georgetown University Law Center. In addition to his painful absence during traditional holiday celebrations, Austin has missed many family milestones, including several birthdays – most notably his grandmothers’ 83rd and 88th and his youngest sister’s 21st. In April, we celebrated our 33rd wedding anniversary. Another of Austin’s sisters graduated from university in December and his baby brother graduated from university in May. Austin’s precious niece performed in her first ballet recital. These are all occasions which will delight Austin’s heart and his inability to share in our joy pained the entire family. Our family is longing for the safe return of our cherished son and beloved brother Austin, who was taken captive while working as a journalist in Syria. So many things have happened in the more than 18 weeks he has been missing. We missed him terribly at the family gathering for the feast of Thanksgiving. We are a close-knit family, sharing so many memories and traditions. Now, as we prepare for the joyful celebration of Christmas, we desperately want our family to be whole. Our hearts are heavy to think his chair may once again be empty at our family table; we dread missing his great storytelling and contagious laugh. Austin is the oldest of our seven children. The Tice kids are very close, and Austin’s absence is agonizing. Like children everywhere, they grew up loving, fussing, challenging and, most importantly, supporting one another. Austin is so proud to be the thoughtful mentor and protector of his sisters and brothers, encouraging them to dream big and work hard to make those dreams come true. He has set an example by never settling for less than excellence in himself. He is an Eagle Scout – Boy Scouting’s highest rank – a diligent student and a frequent volunteer, willingly sharing his time and talent to help others. As a Marine, he earned the loyalty and respect of his men by wholly embracing the call to lead by example. Now, as a journalist, he is determined to get the story and tell it with a deep commitment to honesty and thoughtful analysis. As parents, we encourage our children to learn about and understand other cultures; to discover and explore the things we have in common as people sharing a world that grows ever more connected. Austin has traveled widely, always eager to meet and engage the local people. He has a special affinity for the people of the Middle East; he is especially attracted to your tradition of hospitality. He deeply connects with your intense loyalty to family, faith and ideals. A passionate and serious man, Austin has no patience for shallow and materialistic pursuits. He went to Syria to see the truth and to share the stories of its people. He wanted to experience and understand the fundamental and essential nature of their challenges. Austin’s big heart holds a special place for children. In his professional photographs, he tried to capture how the events in Syria affected its children. Austin has always had an interest in journalism. From the time he began reading, he wanted to know what was going on “all around.” He has faithfully kept a journal. He has written for the newspaper at every school he attended, from middle school right up through college. He was thrilled to be offered a contract to report from Syria over his summer break from Georgetown law school. Austin is just one of the many journalists taking great risks to further knowledge and understanding of other people, places and events. There is a global consensus through treaty and convention that the work of journalists is essential and should be protected and respected. We steadfastly work and pray for Austin’s safe return. We are sustained by our faith and by the kind thoughts and prayers that are being offered for Austin and our family. We are humbled, amazed and deeply grateful for the tremendous outpouring of support and assistance we have received from every corner of the globe; affirmation of all the lives that have been touched by our extraordinary son. We urge you, whoever you are: Let Austin come home for Christmas. Let us hug him, laugh and cry with him, love him in person. Let us be a whole family again. We are relieved to hear of the return of Richard Engel and his colleagues. Certainly it deepens our longing to have Austin safely returned to our family. Journalists serve one of the most basic and important of all freedoms, the freedom of expression and of information. Our hearts continue to go out to all those who remain in captivity and to their families. Our eldest son, Austin Tice, an international journalist, was in Syria on his way to Lebanon when we lost contact with him August 13, 2012. Now, through his silence we are experiencing many of the anxieties currently suffered by thousands of Syrian and Lebanese families who have had loved ones simply disappear. In order to expand our efforts to bring Austin safely home, we are planning to travel to Beirut soon. As we work to be reunited with our son, we are keenly aware of the many families in this region who are also living with uncertainty and longing. We pray daily for peace and stability throughout the Levant, hoping for restoration and a return to normal family life. It is our son’s love for the people, especially the children, of this region which compelled him to come here as a journalist. We know it is also his fervent hope that these children and their families may live in peace. Each November, our family gathers to celebrate the Thanksgiving holiday, a time of shukr, when we feast and give thanks for all our blessings. Right now, there is an aching hole in our family, a beloved son who is missing from our table. It is the responsibility of those holding Austin to keep him safe, care for his needs and return him to us quickly, so our family can be complete when we celebrate the feast of Thanksgiving. Someone knows where Austin is, someone has the power to reach him and to restore him to our family. We ask that person, those people, to show compassion. Allow Austin to contact us, release him to come home. في يوم 13 أغسطس 2012، فقدنا الاتصال مع ابننا الأكبر، أوستن تايس، وهو صحفي دولي، في سوريا عندما كان متجهًا نحو لبنان. والآن، فإننا لعدم سماع صوته نعاني من القلق الذي ينتاب آلاف العائلات السورية واللبنانية الذين فقدوا أثر أحبائهم. ولزيادة جهودنا الرامية لإعادة أوستن للديار آمنًا، فإننا نعتزم السفر إلى بيروت قريبًا. وحيث إننا نسعى للم الشمل مع ابننا، فإننا ندرك جيدًا أن هناك العديد من العائلات في هذه المنطقة الذين يعيشون حالة من عدم اليقين والاشتياق إلى رؤية أبنائهم. ونحن ندعو كل يوم ليعم السلام والاستقرار عبر بلاد الشام آملين في عودة هذه العائلات إلى حياتهم العائلية الطبيعية. إن ما دفع أبننا للقدوم إلى هذه المنطقة كصحفي هو حبه لشعوب هذه المنطقة وخاصة الأطفال. ونعرف أيضًا أن أمله الكبير هو أن يعيش هؤلاء الأطفال وهذه العائلات في سلام. ففي نوفمبر من كل عام، تجتمع عائلتنا للاحتفال بعيد الشكر، حيث نحتفل ونشكر ربنا على كل النعم التي وهبنا إياها. والآن هناك فجوة مؤلمة في عائلتنا، فابننا الحبيب متغيب عن المائدة التي تجمعنا.